In this video, you’ll see a comparison between our two most popular external microphones for the iPhone, the Edutige EIM-001 vs the EIM-003. I did this comparison to help a customer who couldn’t decide if the EIM-003 would be better for interviews using her iPhone 4, or would the EIM-001 be better. So in this video, you’ll see a test of both mics in the same environment, and with some background noise. 2. What you will be recording. Whatever those factors may be for you is the place to start when looking for an external microphone because every microphone has a sweet spot in terms of how it’s used and/or where it’s used. For interviews, a lavalier microphone might be best because it’s placed on the person. But what if it’s impractical to do so? Then try placing the microphone as close as possible without it being in the shot. You may have to creatively frame your shot so the mic isn’t too visible. Sorry, but there really isn’t a one-size-fits-all, do everything, be-all-and-end-all microphone. This is true whether we’re talking about external microphones for making marketing videos with your iPhone, or microphones for making Hollywood films. So that’s where asking questions and watching tests like this one can help. Good audio is more important than good video quality. You’ll hear that time and again, and said in all different ways because it’s true. In certain situations (indoors, no echo, no background noise, close to the mic), your iPhone’s built in mic can work. But you’ll see a dramatic difference in audio quality when you add an external microphone. Ok, so about the Edutige EIM-001 vs EIM-003… I suggest getting the EIM-001 on its own as a good start. 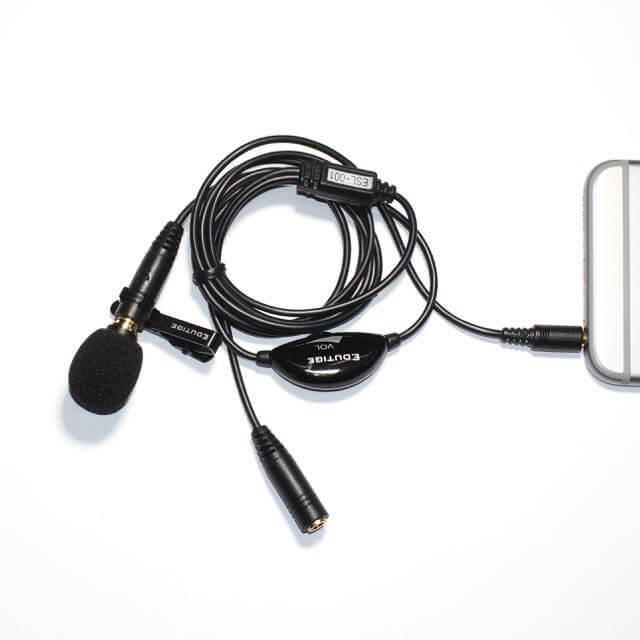 The EIM-001 is great for general purpose recording, and because of how much it boosts the recording volume, you can have it connected directly to your phone and use it like that very effectively. Next on my list would be the EIM-003 with the ESL-001 cable. This lets you get the mic close to your mouth and the EIM-003 is a step up in terms of audio quality. It’s not going to boost the recording volume, so that’s why the EIM-003 works best with the ESL-001 cable. 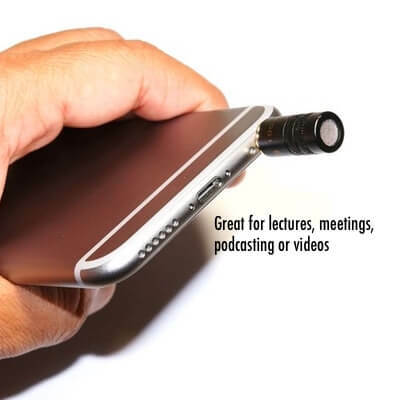 This is a great external microphone kit for iPhone videos and also for podcasting. If you’re ever not sure what external microphone would be best for you, shoot me a question either here or by email at carlkwan@edutige.net.